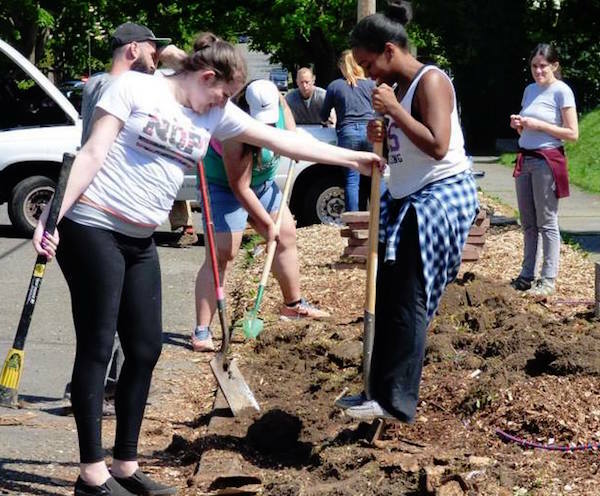 On a recent Monday evening in Seattle’s Central District, a handful of people gathered to work on a community farm. They pulled weeds, talked about the best ways to string up tomatoes, checked the progress of the greens and beans, harvested radishes and planted wildflowers. Someone brought over a bucket of apples, freshly picked from a nearby tree. A neighbor girl rode her bike around the farm, asking questions about what was growing and what else the farmers would plant. A toddler toddled around the raised garden beds, and families out for an evening walk waved hello. 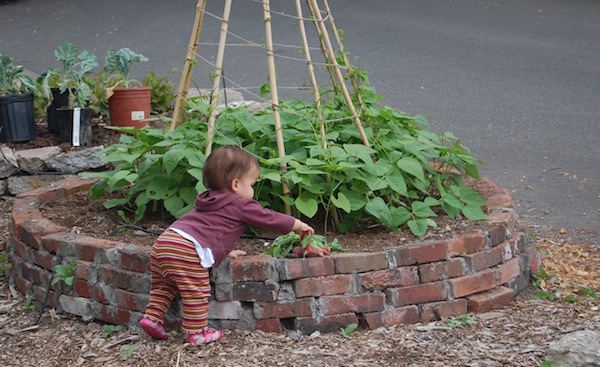 The scene captured the beauty of community gardening. 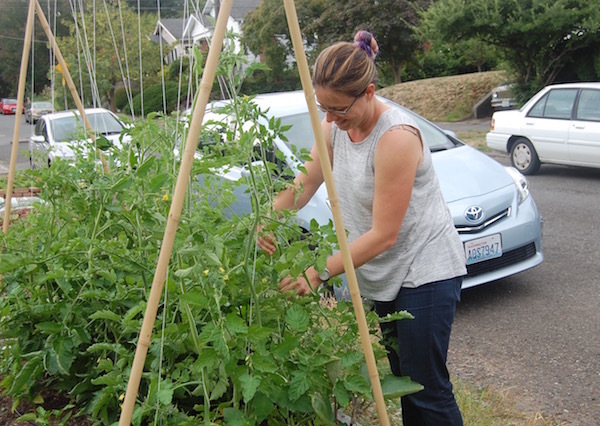 But unlike traditional community gardens, such as the city of Seattle’s P-Patches, this farm is not on a lot—it’s on a parking strip between the sidewalk and the street. And rather than people working on their own plot within a larger garden, everyone here tends to the entire garden, which spans the length of two houses, collectively—primarily on a volunteer basis. Once a week, food from the farm is taken to a nearby food bank. Alleycat Acres relies on the community to help run the farms. The farm is one of three currently run by Alleycat Acres, an organization working to “(re)connect people, place and produce” by transforming underutilized urban spaces into neighborhood-run farms. There are two Alleycat Acres farms on parking strips and a new one in-the-works on a city-owned lot. 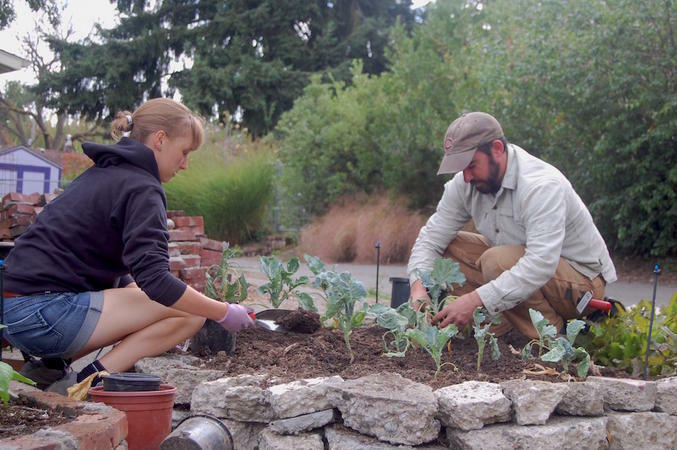 Since its formation in 2010, Alleycat Acres has typically created community gardens and farms on vacant lots. The current building boom in Seattle, however, has left the city with few empty lots. The city skyline is littered with cranes and neighborhood construction zones are a common sight. Over the course of two years, Alleycat Acres lost all three of its original farms to development. With the loss of available lots to build farms on, the organization had to get creative. Converting parking strips into farms has proven to be very fruitful. A nonprofit with fiscal sponsorship from Sustainable Seattle, Alleycat Acres is run collectively in the sense that the creation and maintenance of farms depends on the community. Once a week there are work parties at the farms and volunteers are welcome to work on the farms throughout the week. Farm managers oversee the day-to-day responsibilities. 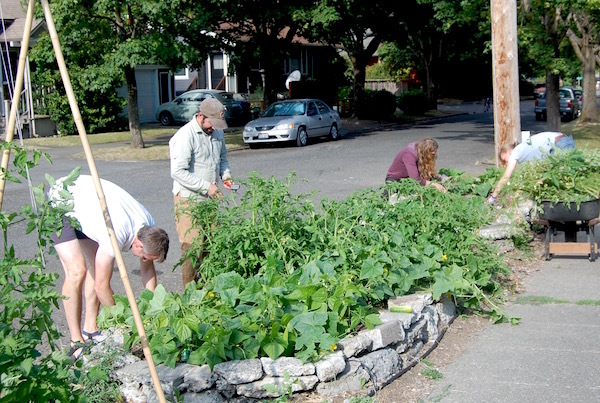 The organization recently received a grant from the city of Seattle to transform a city-owned parcel at a dead end on Wetmore Avenue into a third Alleycat Acres farm. The organization’s ability to quickly create farms is one of its key strengths, but partnering with the city will bring more visibility and potentially lead to the creation of more farms. Each Alleycat Acres farm relies on a team of neighborhood volunteers to keep it running. Before creating a farm at a given location, the organization gauges the interest of the surrounding community. Without community commitment, it won’t move forward because it doesn’t have the resources to run the farm on its own. The model has proven to be successful at engaging neighbors and giving them a sense of ownership. A little member of the Alleycat Acres team hard at work on the farm. Alleycat Acres has survived the immense challenge of losing farms to development and recommitted to their mission to reconnect people, place and produce. Looking forward, they hope to have an Alleycat Acres headquarters with a kitchen for classes, tool storage and office space. For now, however, Dorsch says the fact that Alleycat Acres has weathered the storm of losing several farms and is still going strong is a testament to its resilience and importance to the local community.